Over the years I have reviewed several smartphone afocal adapters. They all allowed my iPhone to be attached to an eyepiece to do afocal astrophotography. 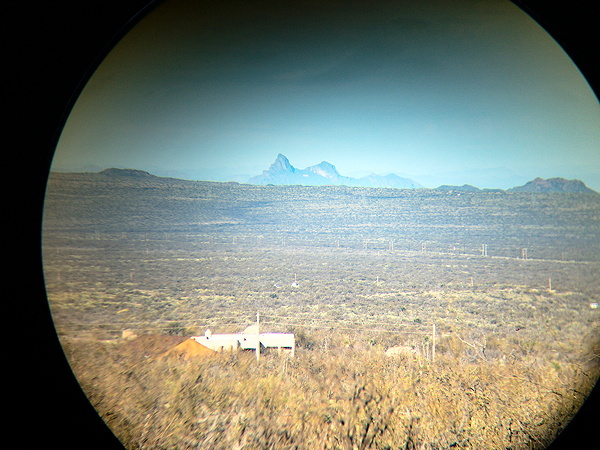 Some worked with binoculars and spotting scopes for terrestrial photography. 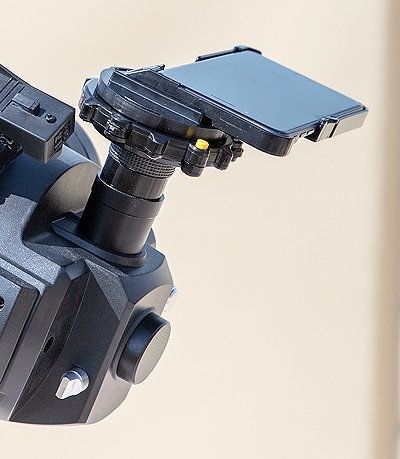 Some of these adapters even have holes that allowed a smartphone to be mounted on a camera tripod for terrestrial photography and sky astrophotography. But every design presented one challenge when attached to an eyepiece, especially for those new to smartphone astrophotography. In order to work with many different eyepieces and smartphones these "universal" adapters have a broad range of movement to get the smartphone camera optically aligned to the eyepiece. On a bright object like the Moon this was fairly easy to do. However, when imaging stars getting the camera aligned over the eyepiece to show the maximum field-of-view can take several minutes of adjusting. That meant unlocking one or more axes, viewing the stars on the live view, and the relocking the axes, hopefully without changing the alignment. Doing this when imaging faint nebulae and galaxies presents more difficulty as the live view is typically dim. 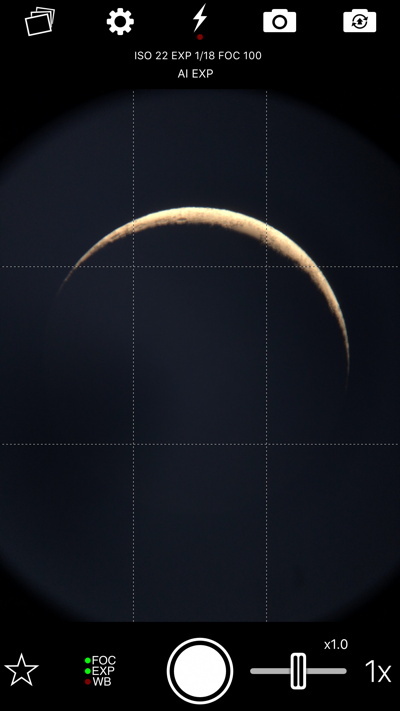 For these faint objects it is best to first do the alignment on a brighter object (e.g., Moon, stars) then slew the telescope to the desired object, hoping that it will be centered in the eyepiece. Or you can remove the eyepiece+smartphone and point it at a brightly illuminated wall or other flat surface, align the camera, then insert the eyepiece on the telescope. All of this can frustrate the new smartphone astrophotographer. When I saw an ad for Phone Skope on Facebook (yes, sometimes Facebook ads are useful), I immediately saw the benefit of their design that avoids this camera alignment issue. 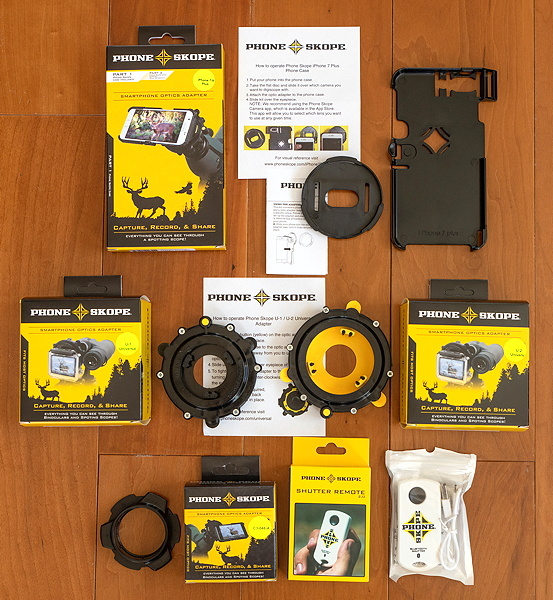 I checked out the Phone Skope web site and learned that they have cases and adapters for almost any application. There are cases for many smartphone models from various manufacturers, iPod touch, and GoPro cameras. There are adapters to attach to various eyepiece styles and sizes for binoculars, monoculars, spotting scopes, rifle scopes, range finders, microscopes, borescopes, and telescopes. In order to get the best possible alignment it is necessary to order the right case and adapter(s). There are adapters available for 1.25" and 2" eyepieces to fit various telescope eyepiece tube outside diameters (1.2-1.8" and 1.7-2.3"). You can also order a custom adapter size that will fit your specific need. The cases cost around $60 and the adapters about $40. 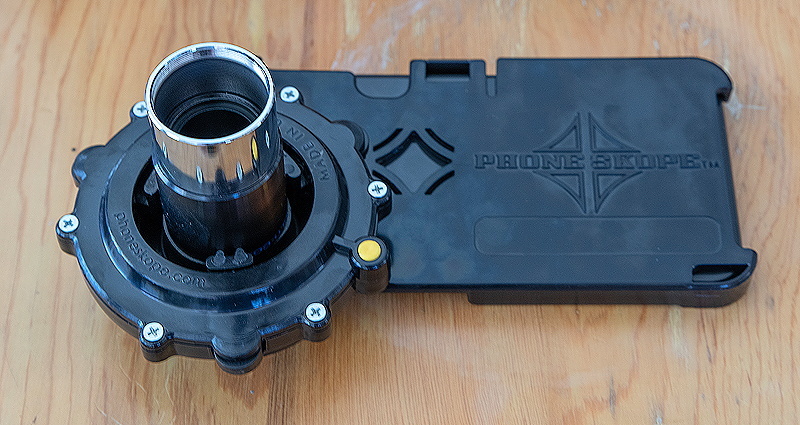 The case and adapters are made of nylon-reinforced ABS plastic. Everything is labeled "Made in USA" except the Shutter Remote. Before I attached the case to my iPhone 8 Plus I tried out the various adapters and the case to see how they fit together. 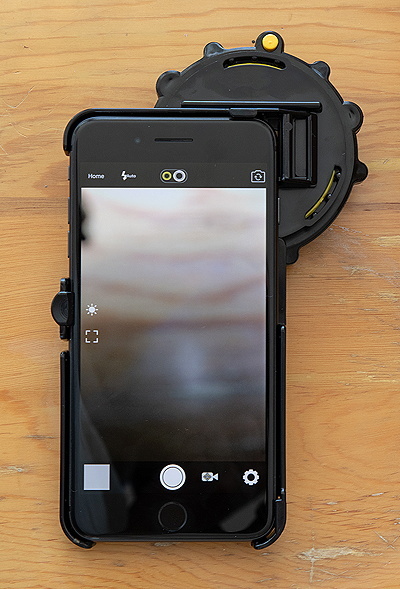 The flat disc can be attached in one of two positions to allow centering the 1X or 2X camera lens (supported smartphones) over the eyepiece. 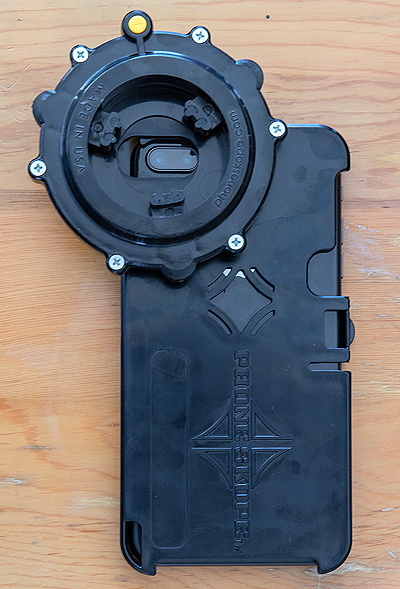 In order to use the other camera lens you have to remove the flat disc and re-attach it in the new position. The optic adapter then twists onto the disc. 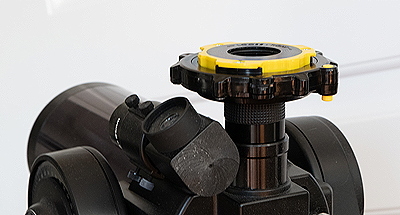 The adapter is rotated to provide a self-centering secure grip on the eyepiece. As with many smartphone cases, the Phone Skope case snaps onto the phone with tabs to secure it. The case does not block the lightning connector at the bottom of the iPhone, nor any of the side buttons. 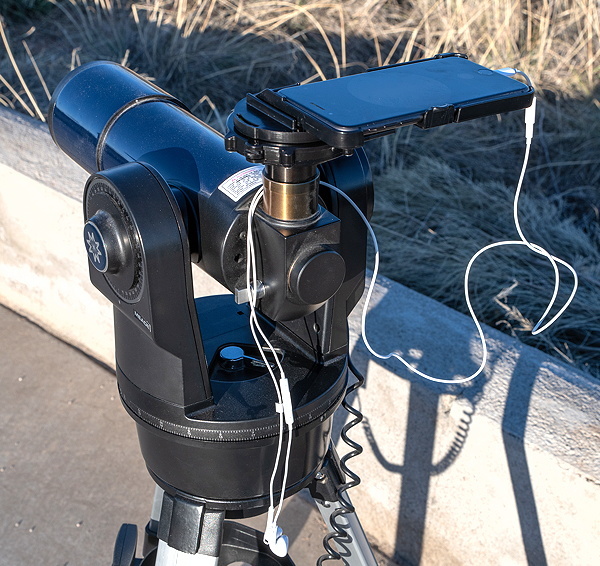 I found that removing the phone was a little difficult, but that is actually good since the iPhone won't fall out of the case while it is attached to a telescope, binoculars, etc. 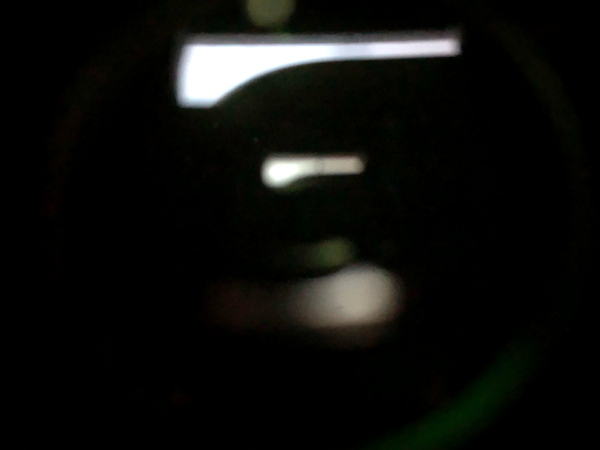 The photos below show the Phone Skope on my iPhone 8 Plus. The camera lenses and eyepiece grips are visible in the photo without the eyepiece attached. The yellow button is a lock for the eyepiece grip. Depending on the eyepiece design and its eye relief, leaving the rubber eyecup in place but rolled up or down can vary the amount of vignetting in the image. The adapters may or may not work with eyepieces that have an irregular diameter at the eye end or with the eyecup attached. Removing the eyecup may help provide a secure grip. The U2 (2" eyepiece) adapter did not have a secure grip my OPT 2" 30mm and 50mm eyepieces with their eyecups attached, but did work fine with the eyecups removed. The U2 adapter did not fit my Explore Scientific 2" 9mm 100° and Baader 2" 8-24mm zoom eyepieces (tube diameters just slightly too great). As with any afocal adapter, always check the security of the adapter on an eyepiece before attaching your smartphone. 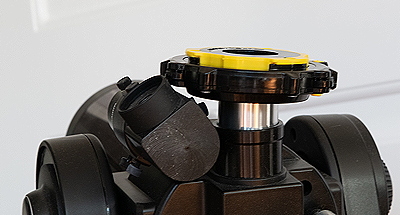 With some eyepieces it may be possible to leave the adapter attached to the eyepiece and use the eyepiece for normal visual use. Other adapters leave an opening between the eyepiece and lens that allows a lot of stray light from the side to enter the lens. 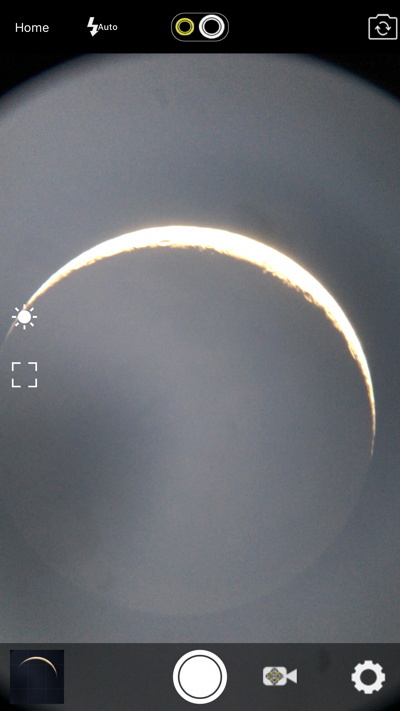 While this is not usually a problem for astrophotography, it can be important for daytime terrestrial photography. With the object in the eyepiece focus using your eye. Attach the smartphone adapter and phone. Align the image seen on the live view. Focus the object using the smartphone focus setting. Adjust the exposure as needed. The Shutter Remote comes with a plastic resealable bag, USB charging cable, lanyard, and instructions. While charging there is a red glow on the remote, which goes out when fully charged (about 1 hour). An ON/OFF switch on the side controls the power. When the switch is moved to the ON position a blue glow appears on the remote for about 2 seconds then goes off. After that there is no indicator that power is ON other than the switch position, so be careful at night to prevent accidentally leaving the Remote turned ON. To use the Remote you first turn it ON, then go to the Bluetooth section in the phone Settings app. Select Phone Skope. Once you have selected it, the Remote should automatically reconnect on future uses. The Remote worked fine with the Apple Camera app, NightCap Camera (my preferred iPhone astrophotography app), and the Phone Skope app. Just press the large black button on the Remote to take a photo. When doing video recordings, press to START then press to STOP recording. 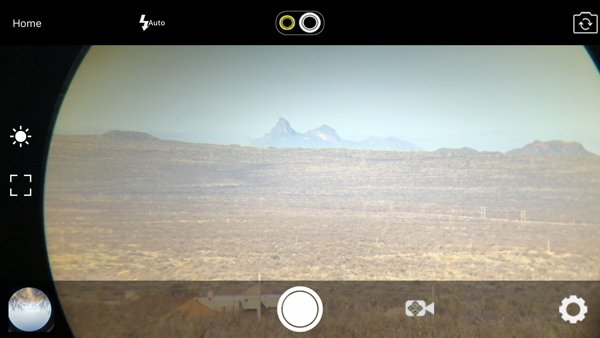 Phone Skope has a free app available that allows controlling exposure, focus, and more for still images and videos. For the models that support it, there is even a Raw photo mode. While this app does not support image stacking for long duration astrophotography like NightCap Camera, it does provide more control than the Apple Camera app. The Earbuds volume control can be used as a remote shutter release or you can use the Phone Skope Shutter Remote. The 1X/2X camera lens toggle is at the top middle (for supported smartphones). You can pitch and zoom on the live view to increase the magnification. There are flash and front/rear camera buttons at the top, neither of which will be used when photographing through optical devices. The brightness and focus selection buttons are at the left. 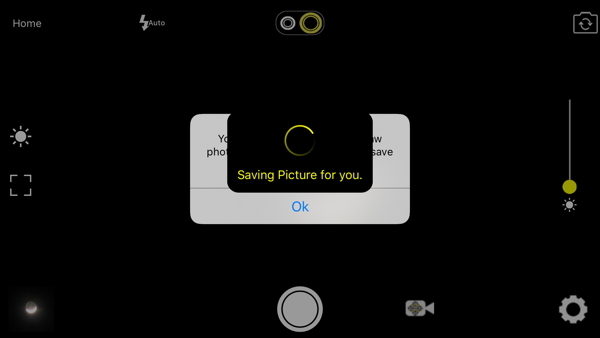 The icon to the right of the shutter button toggles between still and video mode. The settings "gear" at the lower right opens the settings for Stabilization, Filters, Timer, Watermark, Geo Tagging, Save format (JPG, Raw, Raw/JPEG), Photo Quality, Features List (shows what is available with your smartphone). The photo would not save because tapping the OK button did nothing. I presume the alert said that the Phone Skope app wanted to have access to my Photos Camera Roll album, but as I had been taking and saving photos a few minutes prior with the Phone Skope app, this alert should not have appeared. The only way to clear the bug was to fully quit the Phone Skope app and press the power button to put the iPhone to sleep. When the app was next used the bug did not occur. 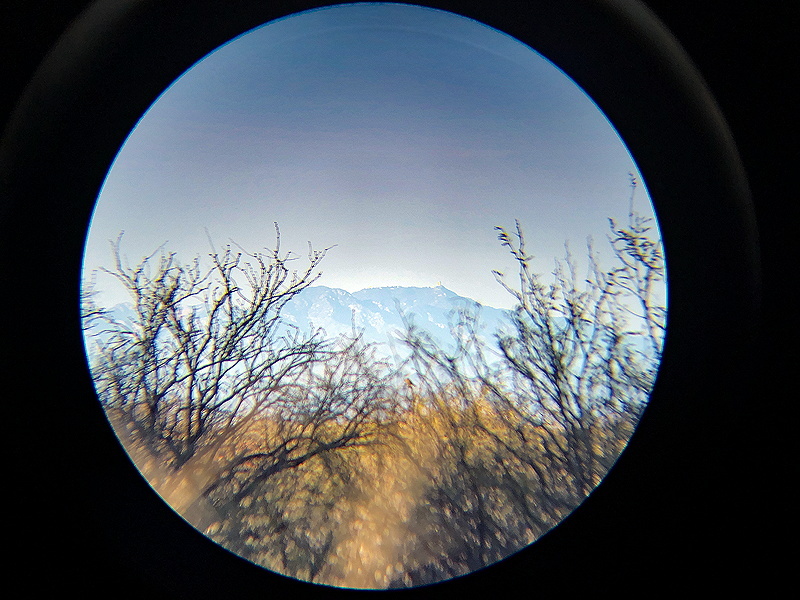 I mounted the binoculars on a camera tripod and attached the iPhone. 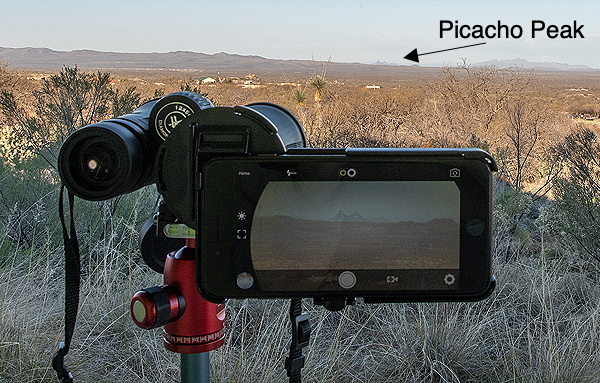 I photographed Picacho Peak (a famous Arizona landmark 31 miles away) using the Phone Skope app and the Phone Skope Shutter Remote. Go to the Phone Skope Astrophotography and Summary page. Comments are welcome using Email. If you are on Twitter you can use the button below to tweet this review to your followers. Thanks.